Apologies for the late update. Many of you had called the organizers regarding the prospects of the tournament. So I am going to make this news as transparent as I can. At about 12 noon today we received an email from the University officials saying, they are officially canceling our tournament in Flower Gardens and Orchard Fields. Vexed as you would be, we went and spoke with them and managed to find us an alternative solution. There are many people who were supposed to travel to State College and we have collected the registration fee from all the teams so far. We put forth all our grievances into what was so far deaf ears. But as luck would have it we have been granted the West Campus Fields to conduct this tournament tomorrow. These fields are near the IST / Leonhard buildings. Proximity of the field is not a problem this time around. 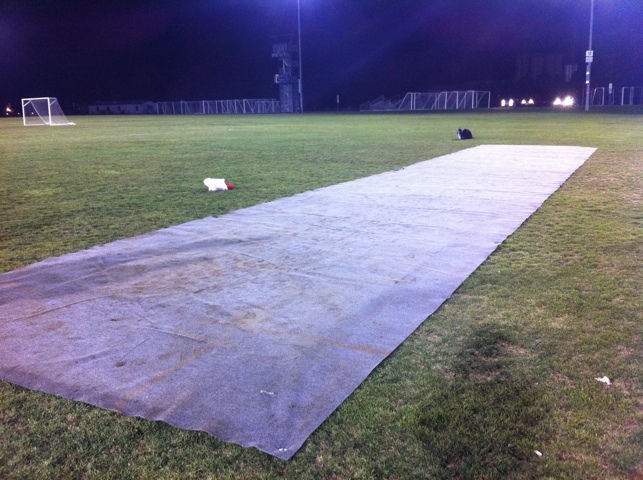 We have the fields on Saturday and Sunday until 10 pm and we also get to avail the floodlights in the ground. This comes as a good and a bad news to the club. Good, because we are somehow pulling this thing together. Bad, because we put in so much effort, money and time to lay the pitch on Flower Gardens and it would have been a perfect avenue for a high quality tournament. But we have decided to move on. Bottomline: The Tournament is back on! All these three games have been cancelled today. We are yet to decide whether we will abandon these three games and share the points or we will try to fit in these games tomorrow into our tight schedule. The IUP Sharks team have withdrawn from the tournament. That would mean we can go one match lighter in the league stages giving way for us to fit one of these three matches. While we are working on these aspects, we thank you for your support to the cricket club. All other matches tomorrow and the day after will go as per schedule starting at 8:30 am in West Campus Fields. Please inform all your team mates. 1. Smoking is strictly prohibited inside the cricket field. 2. We are not even supposed to dig in the stumps into the ground. We will be using stump holders (for which, I have to rush to home depot with my carpentry cap on). So please make sure you guys preserve the fields as much as you can. The field authorities are going to inspect the way we play periodically and we have to make sure we are good kids in front of them. 3. The parking area is restricted to only cars that have valid PSU parking permits. 4. The whole field is fenced and it will allow only the players to be present inside the field. More the number of people inside, more the damage to the field. Though we have cancelled the orders for chairs and tables, we do have stadium benches. Everyone are requested not to flock the field when the games are in progress and use these benches for seating. 5. Please make sure you do not throw away any waste in the ground or the surrounding areas. We have promised to do the clean up after the tournament is over. You could save us some time and effort by throwing all your waste in the trash cans. 1. The pitch is a turf wicket (artificial grass). You are bound to get a lot of bounce and skid off this pitch. It might be a little bowler friendly. Please be on the field 30-45 mins before the scheduled start. We will be starting games as soon as possible. If you have any questions, please don’t hesitate to call one of us. You know our numbers. It has rained for about 8 hours now and the forecasts say it will rain all through the day. We have decided to take a call on the matches one-at-a-time. Announcements will be made half hour before the scheduled start of each game. But, worry not. We have better conditions tomorrow and all matches will go on as per the schedule. For today, Aditya Raghunath will take a call on the first game (PSU Royal Challengers vs. White Tigers) at 4:30 pm. In case, the match cannot played today, we are looking into the possibility of rescheduling the game tomorrow in Orchard Fields. Please check back to see more updates. Thanks to all who came along to help us. Phani Kiran, Ashwin, Shyam, Aditya, Siddharth, Dhiraj, Bhaskar, Vickey, and everyone else whose name I might be missing. The pitch looks glorious under the lights and we should have a cracking tournament lined up. See you all tomorrow. There is not enough bounce on the pitch. Nonetheless, we must have true bounce. The ball when it pitches on some of the soft spots and crease on the mats will hold up a little bit. But one should expect this factor to subside away as the tournament is about three or four matches old. The ball also skids on the surface and it calls for batting with straight bat. This is the pitch that will not require the services of slip fielders unless the bowler can produce the cutters off the pitch. Someone who can turn the ball at a decent pace can be a handy spinner to have in the side. Over all, this one is a great batting pitch. A team with good batsmen on the board will try to bat first and put a huge total on the board. Anywhere between 7-8 runs an over must be a score that can be chased down. One cannot say if a team is safe even if they score 80 in 10 overs. The outfield is still drying up from all the rain we have had the past 3-4 days. But the one at flower gardens is definitely faster than the Orchard Fields. On Friday we are not going to see many boundaries all along the carpet. But I am sure, it will be a classic outfield on Saturday, if we do not have any further overnight rains. A challenging time for the batsmen would be between 6 pm to 7:30 pm or so when the daylight goes out and the flood lights take over. It will be a little difficult to get yourself adjusted. But when the floodlights are in full swing there was no problems sighting the yellow ball in pitch as well as in the outfield. That is a recipe for a spicy tournament. Game on. Teams that have more than 9 players in their squad will be allowed to use one of their non-playing members as a “super substitute”. The name of the super sub must be announced “after the toss” along with the names of other players. This will remove any advantage for the team that wins the toss. However, at any case only 9 players will be allowed to field, bat and bowl. The inclusion of the super sub will imply relieving the duties of one player who is already a part of the playing 9. Most teams use the super sub as a specialist bowler who will replace a specialist batsmen or vice versa. 1. The super sub can come into the game anytime of the match in place of any other player, either after the first ball or only for the last ball, but the moment he comes, one player has to go out and he can’t come back and take any further part in the one day match any more. 2. The super sub can do anything the captain wishes him to – bat , bowl, field or even keep the wickets. 3. The replaced player will be ruled out of the rest of the match while the replacement will be entitled to assume any remaining batting or bowling duties. The Rules for the tournament has been set. All captains pass this link on to your players. Please take a note of specifics about no-balls, free hits and the points system.